← McMaster…Y U No Drop Fees? I would call this post ‘What I Talk About When I Talk About Running,’ but Haruki Murakami already wrote that book and if you’ve read anything by him at all you’ll know mere mortals hardly compare. Yet I do think about things while running, thank goodness, because otherwise laziness would surely prevail. The meditative place some runners can reach eludes me. 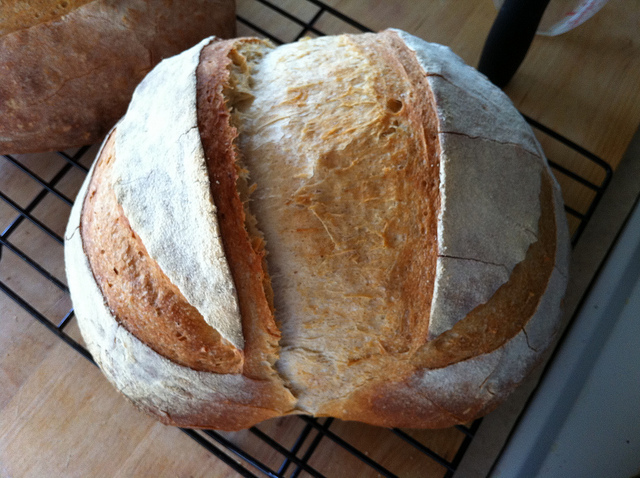 Lately my running excursions have entailed thinking about sourdough bread, and particularly my inability to make any. Why I do might have something to do with the bakery I jog past most days. Sourdough’s persistence has seeped into my non-running life and planted itself there like an ear worm. You see, I’m a decent cook but a very impatient and unlearned (though well-intentioned) baker. Dough thwarts me at every turn. It never seems to turn out as it should and until recently this didn’t bother me much. Heck, I don’t even own a proper set of measuring cups. (I only have the 1/4 cup measure and a set of spoons.) But sourdough makes me want to bake well. It appeals to the historian in me. Today we treat sourdough, to some extent, as a specialty bread, but it’s actually the oldest form of leavened bread there is (ancient Egypt old). It’s made from a sourdough starter, which is a liquid collection of yeast; it is the ‘rising agent’ akin to the standardized, commercial dry yeasts like Fleischmann’s in non-sourdough bread. You can buy commercial sourdough starter, as I learned from a bread machine book near at hand the other day. Unfortunately the authors write off non-commercial (or ‘wild’ starters) in less than a paragraph, and this only hardened my resolve to learn more about it. There are two really engrossing things about wild sourdough starters. One is the connection between a starter and place. Myriad yeasts (and combinations thereof) exist both in the air and on the surface of grains. These vary from place to place, based on the grains used, climatic variations, and so on. When one begins a starter (by capturing these organisms in a mixture of flour and water), it creates a specific combination of yeasts that then stabilizes. Particularly useful ones (based on their sourness, affinity for a certain grain, etc.) are reproduced and become known for the place they originated. (Hence the idea of the ‘San Francisco Sourdough.’) When one adds more flour and water it continues to thrive. To make bread, the baker takes a portion of this starter for creating a dough. The rest of the liquid bides it time, reproducing and eating away. If one refrigerates the yeast they go dormant, but are easily restored with a few helpings of flour slurry. With diligence and care these starters can last for generations upon generations. It is this second characteristic that really fascinates me. Really: is that not the most unbelievable thing you’ve ever heard?! They are maintained and passed down over time, perhaps acquiring subtle changes along the way, but linking families and communities into intricate lattices of knowledge and materiality. Starters are fundamentally historical which challenges the way contemporary society treats food as a very transient thing. Like heirloom vegetables, they speak to longer trajectories of trial and error and of the work involved in developing relationships to non-human nature over time. These interests dovetail nicely with the readings I’ve been doing for my comprehensive exams on environmental history for the past few weeks. In Creatures of Empire, Virginia Anderson discusses European settlers’ experiences with non-human animals in the early American colonies. “Domestication,” she writes, “is as much a relationship as a condition.” The point transcends the book’s specificity. We call them ‘wild’ starters, but in actuality these live organisms exist in environments that entail human and non-human interaction. Yeasts certainly can – and do – exist outside of a human context, but starters are maintained. Moreover, the question of who is domesticated is a prudent one: how has bread figured in human histories? How has bread domesticated us? For the time being I’m going to continue buying sourdough at the local farmers’ market, but I hope to have a starter going once the weather is a little more dependable. (I have a drafty kitchen and no control over the thermostat.) When I do, if any of you in the Hamilton/Toronto area would like to hive some off for yourselves, let me know. Maybe we can get a sourdough bread cooperative going. That’s the thing with this food stuff: I need to find ways of connecting it to communities, to histories, to ongoing relationships and struggles. These are the things I think about while running. you are making me soooooo hungry! oh i look forward to dinner parties next year, yes? where are you aboding these days, Hayley?